Chiang Mai, Chiang Rai and The Golden Triangle: "Personal Growth"
Please click on the image for photos of Chiang Mai, Chiang Rai and The Golden Triangle: "Personal Growth"
My friend Roel and I decided to take a road trip together. Roel lives in Chiang Mai now, so I flew up from Bangkok to meet him. We rented a car and off we went. We started in Chiang Mai and drove south to Lamphun and east to Lampang. Then east to Phrae, north to Nan and north again to Phayao. Then north to Chiang Rai and north to the Golden Triangle and the border town Mai Sai. Finally south to Chiang Mai. Apart from a short visit six years ago to the northwestern town of Mae Hong Son, this was my first extensive trip through the mountains of Northern Thailand. It was a beautiful journey. We found peaceful lakes, busy rivers, ancient temples, modern temples, and even a few temples under construction. 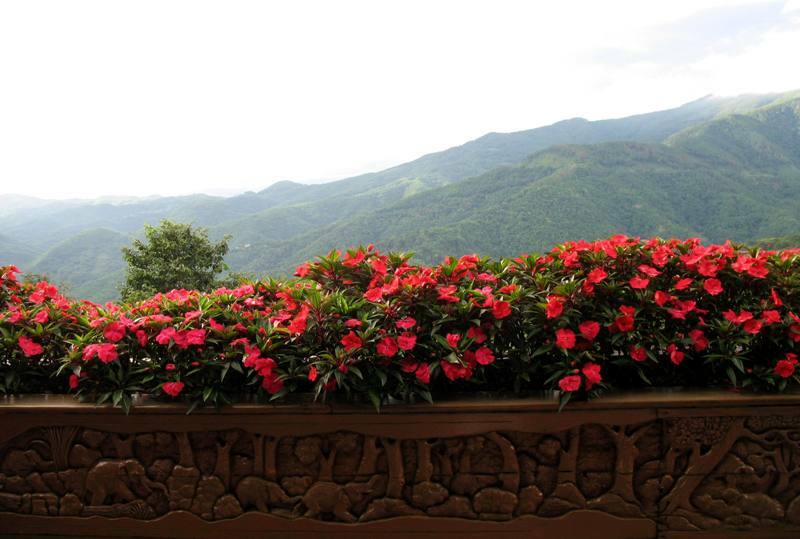 The hills are lush and green with sub-tropical forests and mountainside farmland. I have never seen so many cabbages. I have never seen so many huge cabbages. Rows and rows and rows of cabbages grow up the hills all around us. Small trucks overflowing with cabbages are parked on the side of the narrow roads. The northern cities of Chiang Mai and Chiang Rai attract large groups of tourists. The Golden Triangle, the border area of Thailand, Laos and Burma is a popular spot for both Westerners and Thais. Who can resist a photo-op on the banks of the broad and brown Mekong River? But it's the smaller mountain towns and quiet villages that definitely are our favorites. Here Roel and I are welcomed in the traditional Thai style. A Dutchman and an American, both six-footers, we are greeted as unusual visitors and served as special guests. In Phrae, for a couple of rainy evenings, Roel and I "entertained" a group of young guys and girls, downing our fair share of Thai beer and whiskey. In the lake-side mountain town of Phayao, we met a young woman who was working at her family's restaurant. Nam Pung (Honey) agreed to be our guide for a day and accompanied us to a hillside temple in the mountains overlooking the town. Roel speaks a very little bit halting smiling Thai. I speak a very little bit struggling smiling Thai. Between us it's still a very little bit pathetic Thai. Regardless, at every temple, at every hotel, at every meal and over every beer, our hosts and hostesses respond warmly with genuine smiles, giggles and laughs as though we are old friends and members of the family. Roel and I met in Bangkok . He makes a good living as a specialist in multi-national corporate financial systems. His talents are in great demand since he is an expert in internationally-accepted accounting programs. If I were as good on my piano keyboard as Roel is on a computer keyboard, I would have been a "rock star." My keyboard buddy and I have lots in common including our tastes in reading, music and art. We are both addicted to travel. (Roel has visited more than eighty countries.) We are both addicted to taking photos, of everything. We share an ancient religious tradition. I can trace my family back to Nineteenth Century Eastern Europe. Roel can trace his family back to the Portuguese Expulsion in the Sixteenth Century. Now, hanging around, dining around and carousing around together in Bangkok is one thing, but could we travel together for a week? Normally I travel alone and at my own pace. I am free to make decisions without discussion or compromise. This new situation would be a learning exercise for me. Or as we like to say, "An opportunity for personal growth." Personal growth it was. Roel and I enjoyed a successful partnership. "Want to stop for a coffee?" "Sure." "Lunch now?" "OK." "That hotel looks good?" "Yes, but shall we keep looking?" "Why not." "Climb that hill and investigate the old temple?" "Definitely." "Stop here for some photos?" "Great idea." There was never a moment of stress or serious disagreement. Roel loves to drive. I can read a map. One morning we paused where "two roads diverged" - an intersection off the main highway and an alternate route leading to who knows where. We decided on "who knows where." It was the best decision as we climbed a constantly curving roadway up through splendid mountain scenery and terraced farmland. We stopped for a coffee and a photo shoot at a trekking lodge that overlooks a sunny valley. Roel and I prefer "the road not taken; the one less traveled" and that "makes all the difference." Now as a young man, I do like to warm a bar-stool and partake of the Thailand nightlife from time to time. As a much younger man in his mid-thirties, Roel's nightlife frequently overflows into the early morning. Regardless of our cooperative or independent schedule of activities we never missed a nine o'clock breakfast together. Am I accurate in reporting that Roel and I are curious, responsible, considerate and fun-loving adults? My home now is Bangkok, Thailand . I am happy here. I love the food. I love the weather, usually. I love the culture. I love the people and they return my feelings for them with their own affection and respect for me. Bangkok is also a convenient hub for international travel in Asia and The Middle East. So when I get itchy feet, I can hit the road. There are many countries on my "To See" list. And yet, as a result of this motor trip in the north of Thailand, the important reminder for me and the real Personal Growth is the understanding that there is so much to see and so much to enjoy right here close to home.